(l-r) Lauren Halkerston, Retail Assistant, Paula Farrer, Royal Edinburgh Military Tattoo Retail Manager, Manuela Calchini, Regional Director at VisitScotland. 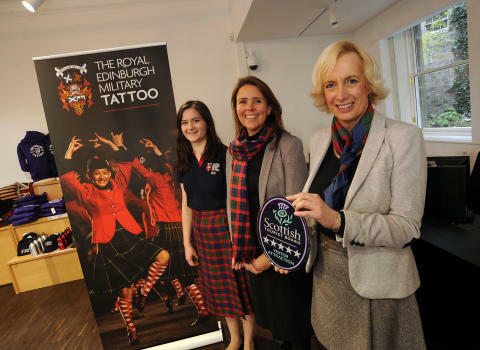 The official shop of The Royal Edinburgh Military Tattoo has struck all the right notes for quality under the national tourism organisation’s customer experience scheme. The annual military spectacle’s official store, located in Edinburgh, has been upgraded from a four to five star visitor attraction, the highest accolade in VisitScotland’s Quality Assurance scheme. Earlier this year the shop was relocated to a Category B-listed building on Cockburn Street, the same building originally occupied by the Tattoo in the 1970s and 1980s. It provides a bright and spacious spot on the connection point between Edinburgh’s Old and New Town, making it a prime spot for tourists and visitors passing through the city. Offering a wide range of Tattoo memorabilia, including scarfs, DVDs and exclusive Tattoo tartan products, it is also the hub for all Tattoo event information and ticket sales. The Royal Edinburgh Military Tattoo is held on the Esplanade of Edinburgh Castle in August every year, and has become one of the main highlights of the festival season in the Scottish capital. Last year the showcase included a cast of more than 1,200 performers playing to an audience of 220,000. Tickets are now on sale at the store for this year’s performances. During the visit a number of criteria were graded by the VisitScotland’s Quality and Tourism Advisor including the appearance and knowledge of staff, presentation and range of products and the layout of the shop floor. The Royal Edinburgh Military Tattoo was graded as exceptional (five stars) for each section. “The Royal Edinburgh Military Tattoo is a spectacular event in the capital’s festival calendar and we are delighted to award the attraction’s official store with our highest accolade for quality. As the shop face of a major highlight in the summer festival season, it is important that customers experience the same top-class service as visitors to the esplanade, and the new premises is a wonderful extension of the stunning visitor attraction. Developed and improved for over 30 years, the Quality Assurance scheme is delivered by a dedicated team of experts who offer valuable business advice and support. The scheme is not just about driving standards; it aims to help businesses reach their full potential so they can reap the benefits and secure their success. 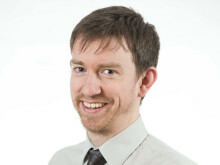 That in turn delivers benefits for the economy of their region and for Scotland’s tourism industry.